Well, we always knew that this calving season was going to be a challenge, and it hasn’t disappointed. It’s enlightening to think back on other years, which were busy enough in themselves, that now appear to have been quite manageable, and even pleasant, by comparison with this. As the construction team continue to get extra housing ready, the calf team are constantly having to move calves and improvise with the facilities at hand. We have to applaud the dedication of our young team, who are working very hard despite numerous challenges and complications, new and old. Last year we introduced the Rispoval Intranasal vaccination for our nine day old heifers, this seemed to eradicate any problems we had previously encountered with Pneumonia. Unfortunately this year we have had a spate of incredibly high temperatures, which seemed unexplainable, as there was no sign of scouring or coughing. The calf team diligently kept tabs on temperatures, and jabbed with antibiotics and anti-inflammatories according to our “temperature of unknown origin” protocol. We had the vet out to have a look, who sent away blood and saliva samples to be tested, and it seems that our calves had encountered a different strain of Pneumonia, not covered by the intranasal vaccine – typical! However, we were pleased with the feedback from the vet, who praised the team on the excellent colostrum levels found in all the tested calves. He also encouraged the somewhat downcast staff (no one likes having sick animals) that the condition of the calves, and the speed with which they had noted the illness, meant that the calves were in a really good position to fight the infection. The fallout of this irritating new Pneumonia strain has been the loss of a few calves, one of which was a heifer, but we have tried to emphasise to our staff that the number of serious casualties is minute compared to what it could have been, had they not been so diligent. Having just weaned our first 30 heifer calves, after reaching over 250 calves on milk at once, we can begin to imagine a time when calf feeding won’t be the main feature of every day. But there is a long way to go before we reach that happy time, and there will no doubt be plenty to do at that stage too! We have at least one comforting thought as we finish with dairy calves and move onto Angus exclusively – thank goodness we chose a polled beef breed! 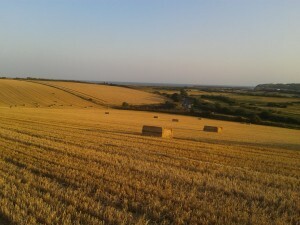 Meanwhile in the field, the harvest of wheat and straw has been a bit stop start, and we are currently waiting for the contractor to finish the wheat. John is glad that there is enough storage space for our straw this year, despite every spare corner of the farm being filled with cattle. 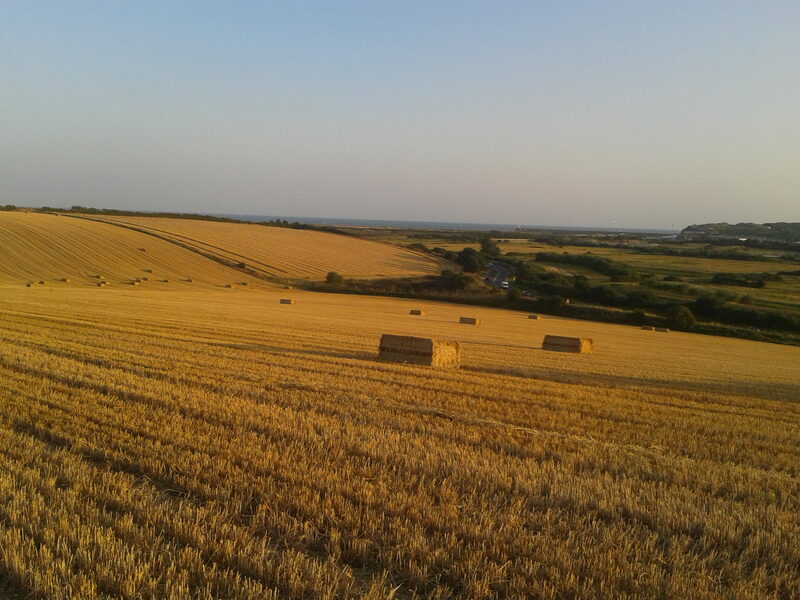 We have thankfully been able to rent straw storage close to our two outside sources, though the barns we are using are located at opposite ends of East Sussex, one site even pushing the Kent border. We are pleased that the maize crop is maturing well, though the harvest is looking like it will be a big job for our old machine, with nearly 600 acres to cut with a 4 row Kemper. We are, as always, encouraged to see the tank start to fill up, as our early calvers begin to reach peak yields. Our good friends the vets have been taking an objective look at our milking protocols and mastitis records recently, as we continue to try to lower our cell count. They have observed a milking and are currently looking at our data, and we hope that they will be able to advise us on how to improve in this area, in preparation for our change in milk buyer. As we come to the end of our notice period with Freshways we wish to express our thanks for the trouble-free time we have enjoyed while working with them.